GradSchools.com had the opportunity to speak with professor Colleen Lelli, who teaches education at both the undergraduate and graduate levels at Cabrini College in Radnor, Pennsylvania. We were interested to discover the differences between being an undergraduate and a graduate student, and how professors perceive the two types of learners. Q. Do you prepare differently for graduate students than you do for undergrads? If so, how? A. Yes, I do prepare differently. Graduate students are held to a higher caliber than undergraduate students. Graduate students are expected to have better research skills and more in-depth and applied knowledge. However, graduate students may have other responsibilities, and that is a consideration most professors take into account. Q. What are your expectations of your grad students in contrast to those for your undergrads? A. 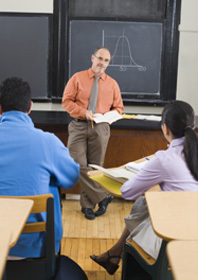 Graduate students are expected to provide insight and relevant experiences to classroom content. Graduate students should already have the relevant background experiences necessary for further exploration for research and insightful classroom discussions. Q. Characterize as best you can the student/teacher relationship in graduate school and how it differs from the undergrad relationship. A. At the undergraduate level, the teacher needs to guide students to become better researchers and to think more critically regarding various issues. At the graduate level, I almost see the teacher more as a sounding board for affirmation or guidance in issues regarding the graduate program. Q. What would you tell graduate students they need to do in order to prepare for graduate school? A. Students need to work hard! They need to be prepared to juggle many life issues at once and be able to focus on the work in graduate school. They need to be willing to be a class contributor and continue in the area of research. Q. What can graduate students expect when beginning a program? A. When beginning a program, students should expect to feel overwhelmed. Once the student gets used to juggling work, life responsibilities and graduate school, it will become easier. My best advice is to develop a schedule and develop a time management plan. By sticking to a time-management plan, the student will feel less overwhelmed and be better able to handle the new responsibilities of graduate school. Q. Why would you encourage people to attend graduate school? A. I feel that all education is important. Education is power, and the more knowledge students have regarding their area of study, the better people skills, social skills and research skills they will have. Q. How do you try to meet the flexibility needs of your grad students? A. I try to understand that students have various schedules, strengths and needs. Every student has different learning styles and needs. I try to take each student's situation into account and realize that what one student needs, another may not. Q. How have you seen your graduate students (particularly adults) balance school, work and life? A. I must say my adult learners seem to do very well with balancing the many issues they have going on such as school, life and work. Not to say that my other students don't do well, it's just that the adult learners seem to be able to keep up with little or no foreseen problems.